With fabulous views over the South coast of the island to the sea, a bright and colourful interior and a great location within easy reach of Son Bou's beautiful beach and centre, it's not hard to see why Villa Corina is part of our Very Villa Plus programme! This impressive 4 bedroom, 2 bathroom villa is only a few minutes walk from a choice of shops and eateries with the beautiful Son Bou beach around 10 minutes on foot or a couple of minutes drive. WiFi, pool heating and air conditioning/heating in the bedrooms are included. Villa Corina is stylishly furnished throughout, with bright and airy rooms, and a traditional high beamed ceiling. The living area is open plan with comfy seating around an attractive feature fireplace and a dining table and chairs. The compact but well equipped kitchen is adjacent. A hallway leads directly from the lounge to the villa's bedrooms. There is a single bedroom and twin bedroom on the right. At the end of the hall is the double bedroom which has an en suite bathroom. All 3 of these bedrooms have patio doors onto the raised BBQ terrace with steps down to the pool. A second single bedroom and separate bathroom are on the left of the hall. Villa Corina has a private, off road parking area for your hire car with a path leading to the entrance. There is also a gated pedestrian entrance if you park on the street. Tourist Licence Registration: HT 255 ME. 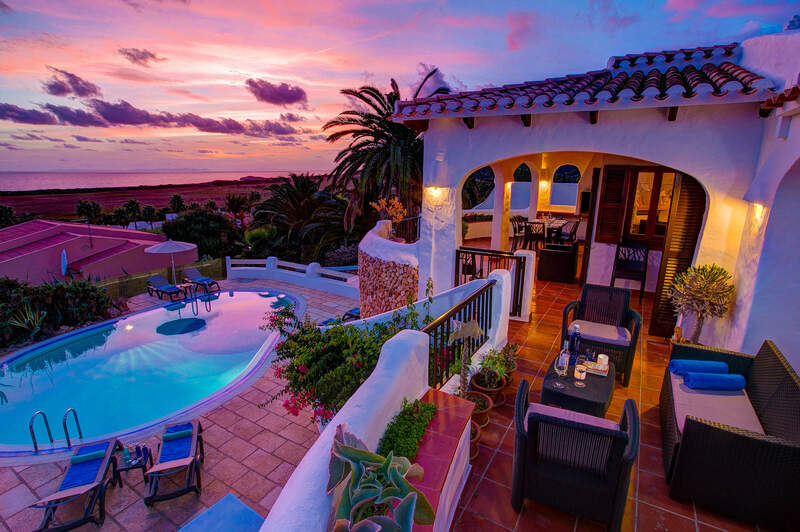 Villa Corina is located in the Torre Soli area of Son Bou, a few streets back from the resorts beautiful golden beach, in an elevated position securing excellent views over the rooftops to the sea. The bustling resort centre of San Jaime is within a few minutes walk and has a fantastic choice of shops and restaurants. The entrance to the beach is 1 mile away and can be reached either on foot or by car. Located in a tranquil residential area of Son Bou known as Torre Soli, Villa Corina is in the perfect location for anyone wanting their own space but with the beach and facilities of this popular resort all close at hand. The resort centre, San Jaime, has a number of shops, bars, cafes and restaurants, with a couple of beach bars on the sand. There is a small but well stocked supermarket just a short stroll away from the villa. The beautiful long, sandy beach slopes gently down into clear blue waters. On calm days there is a good choice of water sports and the beach bars are perfect for that lunchtime snack or a long cool drink. Please heed the red flag which flies on days when bathing may not be safe. The lido at the San Jaime complex has extensive terraces and lawns surrounding the large pool. An afternoon can be spent amusing the children on the water slides and nightly entertainment is posted on the board at the restaurant entrance. Or visit the archaeological site at the Eastern end of the beach and wonder at the headland, honeycombed with caves. Enjoy nature at its best as the beach progresses westwards, becoming wilder, backed by dunes and marshes and home to a thriving bird population. Truly a paradise for the summer visitor. Villa Corina is not available to book for season as it is sold out. Take a look here at the Menorca villas that are currently on sale. Beautiful villa which had everything you would need for a relaxing comfortable holiday . We enjoyed are stay so much. Faultless :-) We had a fantastic holiday from start to finish,all travelling arrangements went smoothly outbound and inbound will definitely use Villa PLUS again. Thank you. Villa Corina in Son Bou was lovely would definitely go again. We had the most relaxing holiday in Villa Corina. Superb villa, clean with excellent pool and facilities and fantastic view - it was great having table tennis and pool table to occupy us too. Would definitely love to go there again. Great Villa in a quiet location with great far reaching views, the villa was clean and well kitted out. superbly appointed spacious superb views pool outstanding.all in all could not fault it. Very nice villa, just a bit out of the town as we did not want a car so a long hilly walk was required. But it done us good !! First time we have used Villa Plus - very impressed both with the range of properties and the standard of service. This was the best villa we have stayed in. More like a home rather than a holiday villa. The pool was superb. Being able to view the position of the villa via Google Earth makes all the difference to identifying the actual situation of the villa.